Auto-generate a markdown file from coding history to use for creating blog posts or just to review changes from an interrupted task. automark enables reviewing, sharing, and summarizing programming tasks by automatically generating markdown from your coding history. Document how to perform a similar task in the future. allow developers to focus on the narrative of a blog post. See the full example of a blog post created with automark. Automark is designed to support episodic review, a cognitive process for walking through and reasoning about recent code changes, mistakes, and events. read a autogit repository and generates a series of time-ordered code changes. support for rendering and displaying unified diffs. include additional references, such as visited Stack Overflow questions or official documentation pages used. To use automark, first ensure that autogit has been installed first. To generate a markdown representation of the recent coding task, select Tools -> automark -> Generate Markdown. This will generate a markdown file stored in$SolutionFolder\.HistoryData\md\Timestamp.md and then open it in an markdown editor. For windows, I recommend using Markdown Pro. From here, the markdown can be annotated and further later generated as a html. To generate a rendered html representation, including diff highlighting, select Tools -> automark -> Generate Html. 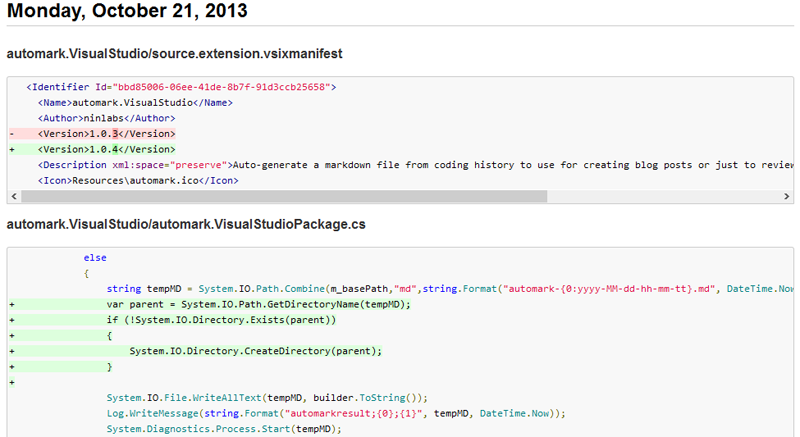 Download .vsix and double click to install, or search for "automark" in Online Gallery in "Visual Studio's Tools > Extensions and Updates" tool menu. To install from source, first install the Visual Studio SDK 2012 in order to build project. Then install the resulting .vsix file. 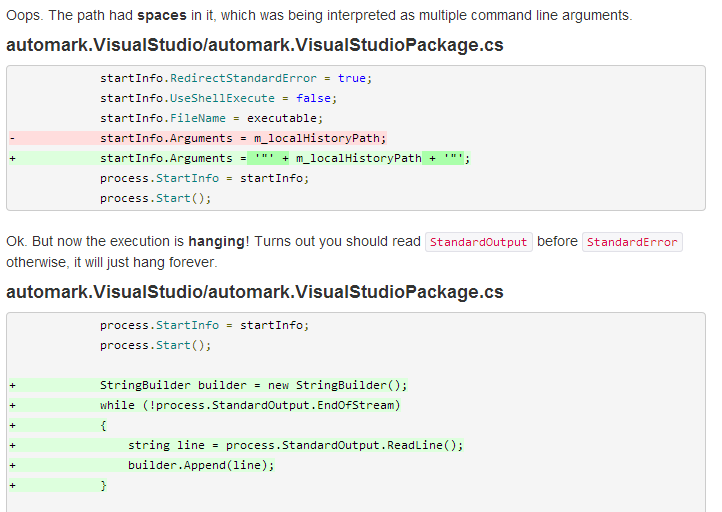 Natural language summaries of code snippets. Create an issue for new feature request.